Mix 1/4 cup water, the vinegar, honey, soy sauce, ginger and pineapple juice. Place tofu in small glass or plastic bowl. Pour juice mixture over tofu; toss gently. Cover and refrigerate 1 to 2 hours. Remove tofu from marinade; reserve marinade. Dissolve cornstarch in 2 tablespoons water. Heat sesame oil in wok or 12-inch skillet over medium-high heat. Add onion and carrots; stir-fry about 3 minutes or until crisp-tender. 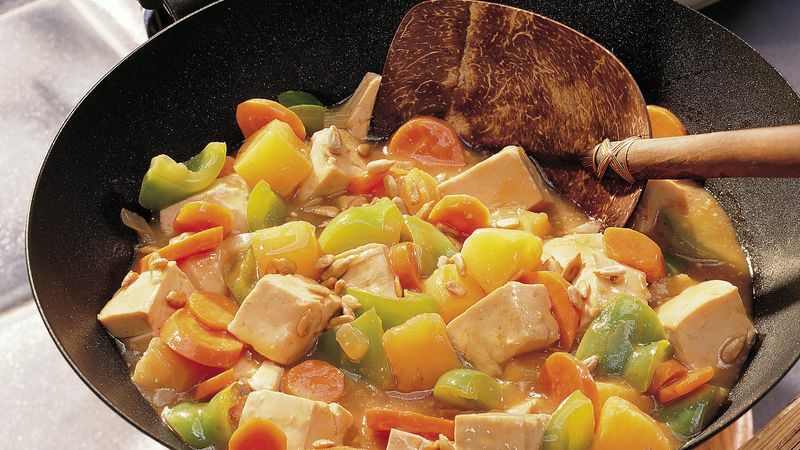 Add pineapple, tofu and bell pepper; gently stir-fry 2 minutes. Stir cornstarch mixture into reserved marinade; pour into wok. Cook 2 minutes, stirring occasionally. Reduce heat; cover and cook 2 minutes. Serve over rice. Sprinkle with nuts. Tofu is sold in blocks or cakes in three textures: soft, firm and extra-firm. Look for it in sealed packages in the refrigerator section of the supermarket. To reheat leftover rice and restore its fluffy tenderness, stir in 1 to 2 tablespoons water and heat in a covered saucepan.